The Altura Airstream long sleeve cycling jersey is a great option for autumn or early spring rides when you’re looking for a little more insulation and protection from colder conditions. Made from Altura Thermo™ thermosuede fabric with a slightly more relaxed fit than some long sleeve jerseys there’s plenty of freedom of movement both on and off the bike. The Airstream is a great jersey for chillier mornings or riding at higher altitudes any time of the year and is a capable cold season classic. Nice Jersey. I bought the HI Viz yellow as a commuter jersey, i'm a lean 82kg 188cm and it's a slightly relaxed fit in Large, without being baggy. 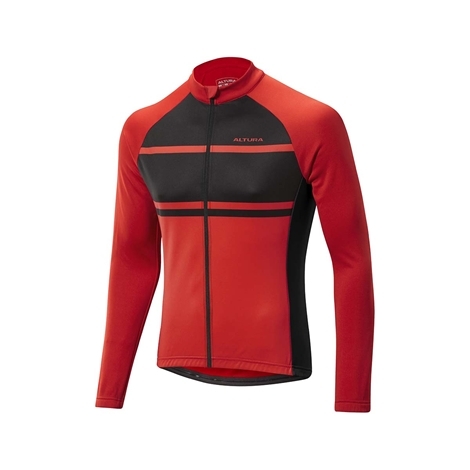 I ordered this Thermo Jersey in red after being pleased with the previous one in yellow. The material and construction is outstanding for the price. I was able to layer it for added warmth. I'm in my sixties and I don't have washboard abs. This jersey fits me well. Sizing chart was accurate for me. I got a Hi Vis yellow medium and it fits perfectly everywhere, except that the neck could be a bit tighter. Having said that, love it and it is seriously visible and quite warm (but I'm in Melbourne, Australia and our winters aren't cold by European standards). On colour choice: don't be an idiot. Get Hi-vis. Don't give a car driver an excuse for not seeing you. On that note, check out the Hornit cycle horn too! Fit was great. Material and construction seem to be of good quality, though I have only had it a short time. No complaints; I am very happy with my purchase.